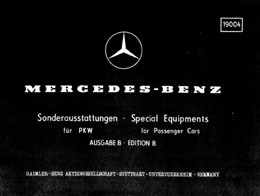 In addition to the Mercedes-Benz factory manuals listed elsewhere on this page, the following publications are valuable resources for researching Ponton-related facts and figures. 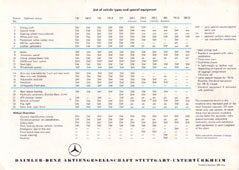 Illustrated Mercedes-Benz Buyer's Guide / 1994 Frank Barrett / ISBN: 0-87938-902-8 / Editor's Note: The 1994 edition contains a useful Index of model, chassis, and engine numbers, which was omitted from the later edition. 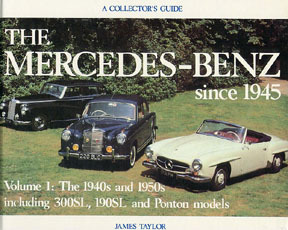 The cover of the 1994 edition features a silver Type 300SL "Gullwing." This Amazon link (also shown above) is for the 1994 edition. 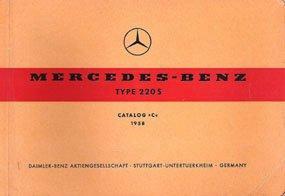 Contact information for Service Manuals from the Mercedes-Benz Classic Center (Germany) was accurate as of June 2002. As of October 2012, they only stock hard-copy manuals in German. The part numbers are printed on the documents, and may be different from the order numbers. 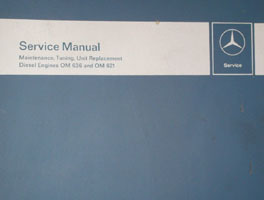 Service Manual Model 190 (SM-1207-000). All Ponton owners need this 992 page manual because it contains repair instructions for all models in the range. No longer available (NLA) in print from OEM sources. 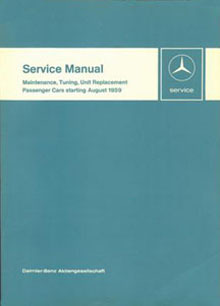 Original MB Service Manuals are sometimes available from on-line auction sites and book vendors. Service Manuals are provided elsewhere on this page in zip/.pdf format. 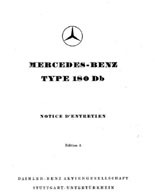 If you own a Ponton model other than a Type 190 or 190b, you will also need the Service Manual Models 180 to 220SE (SM-1201-000). 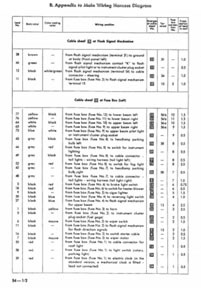 This 622 page manual is described as a "Supplementary Manual to Workshop Manual Model 190", and covers models other than the 190 and 190b if/when the information is different from the 190 manual. Specific coverage: Types 180, 180a/b/c/D/Db/Dc, 190D/Db, 190SL, 220a, 220S, 219, 220SE. The Service Manual Models 180 to 220SE (SM-1201-000) does not provide full coverage for the diesel model Types 180D/180Db/180Dc/190D/190Db. Service Manuals are provided elsewhere on this page in zip/.pdf format. 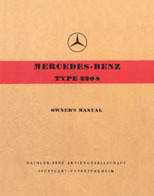 Diesel engines — The Mercedes-Benz Classic Center does not list the printed edition of Diesel engine manual OM 636 and OM 621 (SM-6540-2166). However; it is included with the two CD-ROM Service Manual Library Volume 2 set. Service Manuals are provided elsewhere on this page in zip/.pdf format. 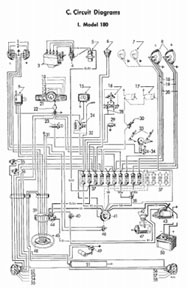 Fuel Injection — The fuel injection systems found in the Type W128 Ponton series models (220SE sedan, coupé, cabriolet) are covered in Job No. 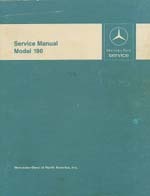 07-10 of the Service Manual / Maintenance, Tuning, Unit Replacement / Passenger Cars starting August 1959 (651 014 02 13). This manual is included in the two CD-ROM Service Manual Library Volume 2 set. Service Manuals are provided elsewhere on this page in zip/.pdf format. 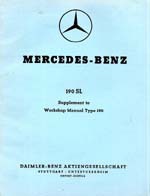 The 75 page 190 SL Supplement to Workshop Manual Type 190 (SM-1204-111) may no longer be available from the Mercedes-Benz Classic Center (inquire). 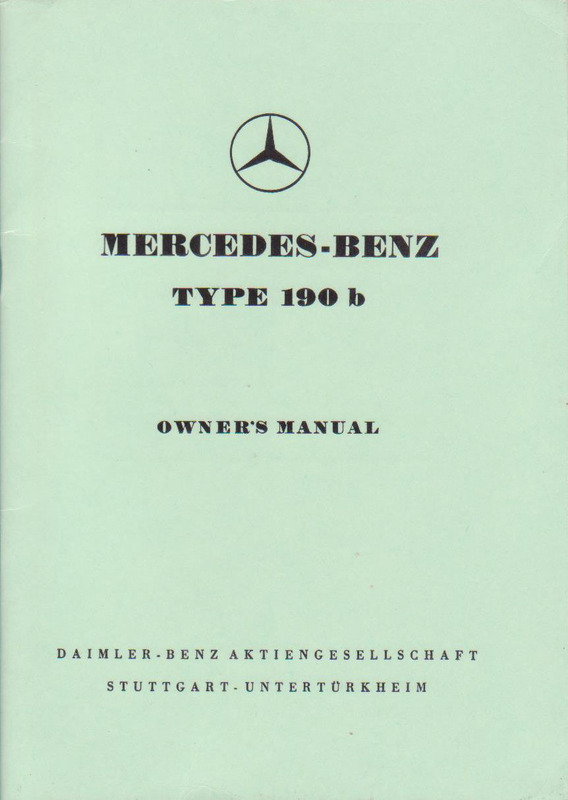 The Service Manual for the (pre-Ponton) Type 220 (W187) (7/1951-5/1954) and Type 220a (W180) (Ponton) may no longer be available at the Mercedes-Benz Classic Center (inquire). 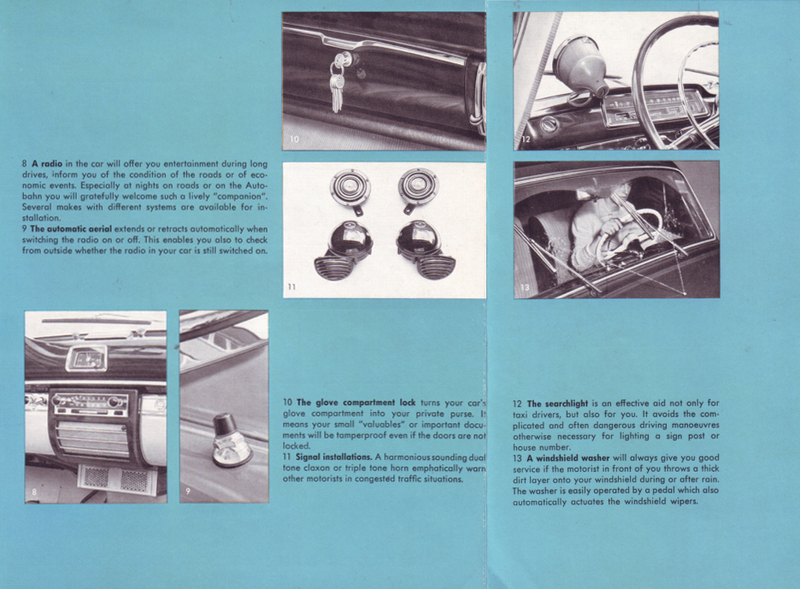 Technical Data Passenger Cars / December 1957 Edition (S-2588-000). 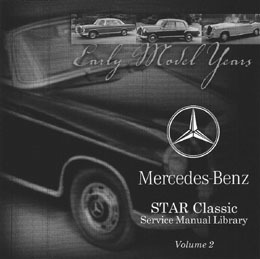 As of January 2004 this reference manual was still available as a reprint from authorized MB agents. A pocket sized manual (115 mm x 150 mm) consisting of 288 pages. 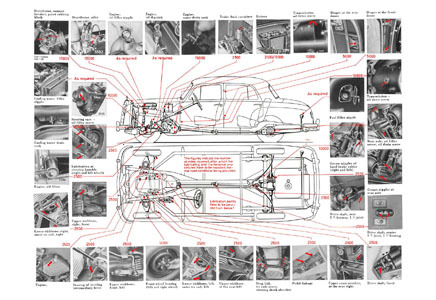 It contains technical data, illustrations, and specifications not always found in other factory service manuals. In addition to covering the Ponton series Types 180a/180D, 190, 190SL, 219, 220a/220S (12/1957 Edition), it also covers the Types 170V/Va/Vb/S-V/S/Sb/D/Da/Db/DS/S-d, 300b/c/d, 300S/Sc, 300SL. The book is an indispensable resource for obscure minutiae. Contained are data about capacities and operating materials, dimensions, weights, measures and tolerances, settings, performance curves and much more. Check with your local MB agent regarding the availability of various other editions. 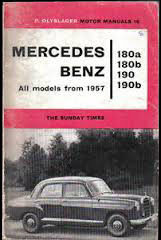 There is also a 10/1960 edition (S-2471-000), which covers later Ponton models. Order number 6516 0700 30. 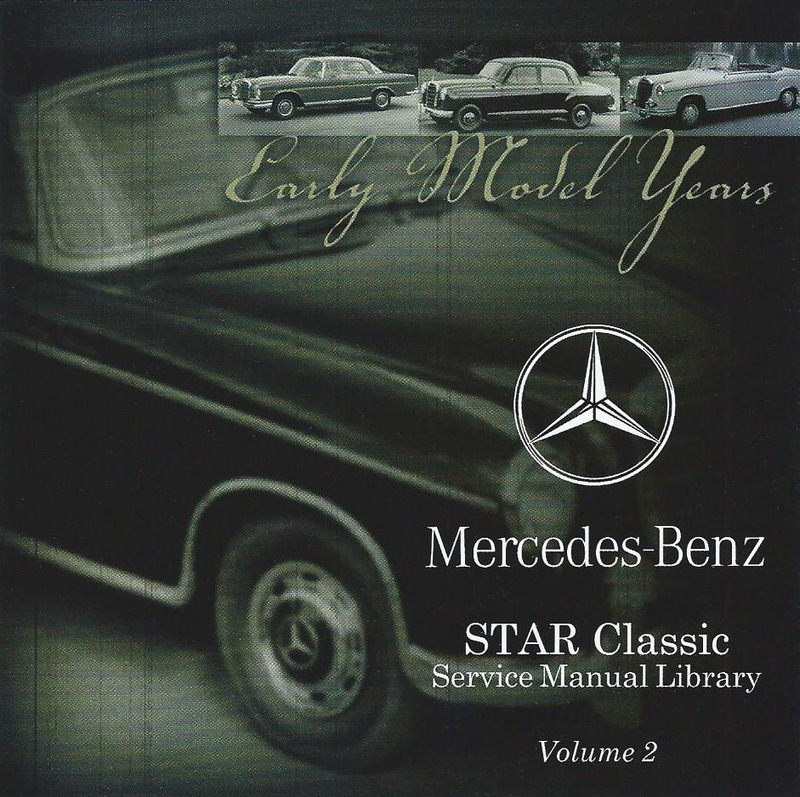 As of January 2004, the MB Classic Center offered a Maintenance Booklet for specific Ponton models. In German with English and French translations. Maintenance Booklets "Serve for the documentation of the maintenance jobs and give notes over their extent and time." The two CD-ROM set is NLA from Mercedes-Benz. All Service Manual content from the original two CD-ROM set is included in these zip files. Used with permission from M-B Classic Center / Irvine, California / March 2014. Illustrated parts catalog: Original-Teilekatalog Baumuster PONTON 180b, c, Db, Dc, 190b, Db (Bestellnummer: L6510000014). 2001/2002 Edition. Soft cover, 90 bound pages, written in German. 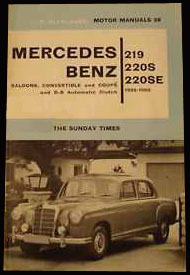 Illustrated parts catalog: Original-Teilekatalog Baumuster PONTON 219, 220a, 220S, 220SE Coupé, Cabriolet (Bestellnummer: L6510000008). 2001/2002 Edition. Soft cover, 172 bound pages, written in German. 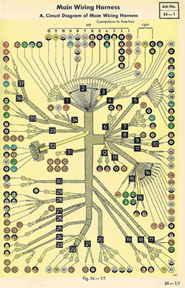 The MBIG illustrated parts catalogs cover production data, color codes and various data card formats. 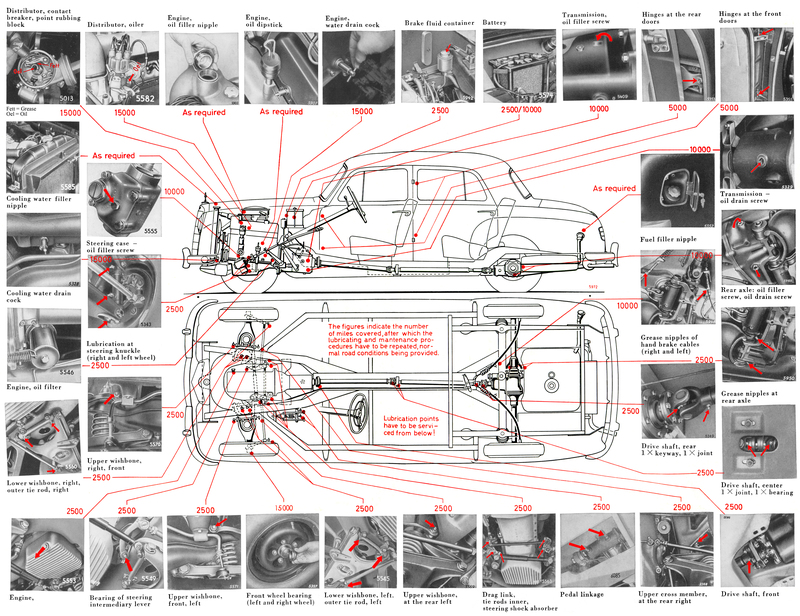 All sub-assemblies are illustrated (black and white) with current part numbers per the Mercedes-Benz Classic Center. Includes a separate soft bound PREISLISTE (price list) (Bestellnummer: L6510002002B) for both 4 and 6 cylinder Ponton models. Note that these catalogs are often sold by MBIG on eBay (and the German eBay site, www.ebay.de). Check with MBIG for price and availability. Mercedes-Benz SPECIAL One and two-tone special paint finish with standard upholstery 180 - 180D - 190 - 219 - 220S. 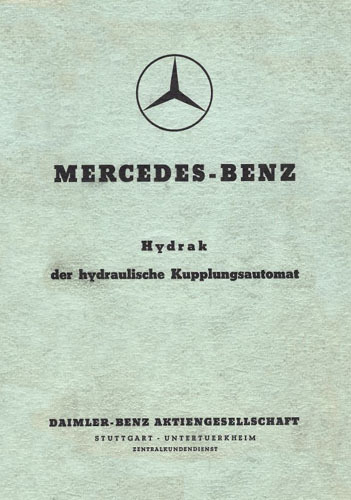 This two sided, full color folding pamphlet appears to be a reproduction of an original Mercedes-Benz document. Includes color code information as indicated on front cover of pamphlet. Upholstery codes are not shown in color. The printing is high quality. No part number listed. Check with MBIG for price and availability. Also, see the Color Chart page for more detail. 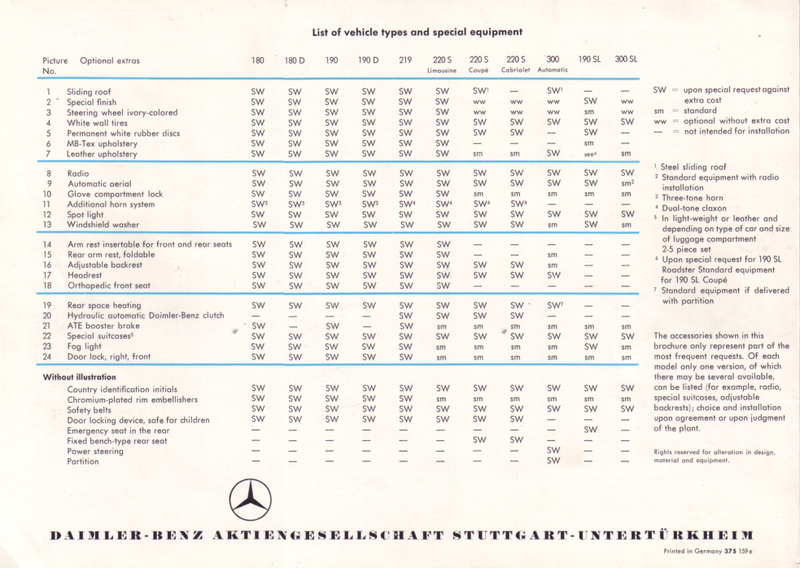 This Service Manual refers to the passenger cars built from August 1959 to December 1967 of the Models 190c, 190Dc, 200, 200D, 220b, 220Sb, 220SEb, 230, 230S, 230SL, 250S, 250SE, 250SL, 300SE, 300SEb, and 300SEL. 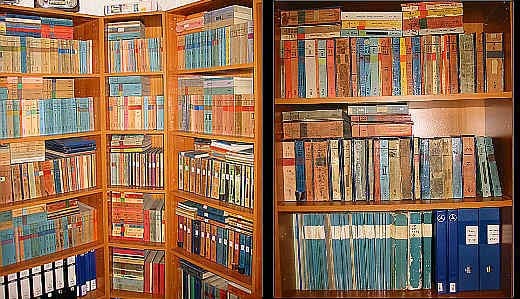 Automotive magazines and periodicals are an excellent source for current and local listings of parts and services. Please refer to the following sources for listings in your area. 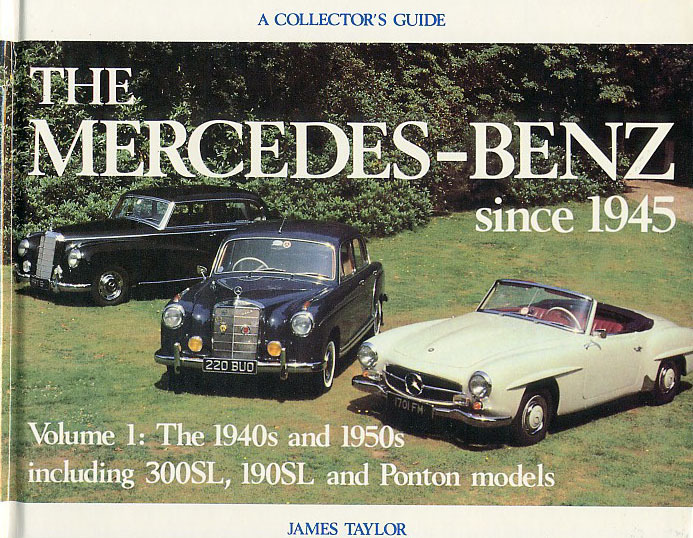 Ray Ilich launched the Mercedes-Benz Ponton website on September 25, 1995 and continued to support it through 2000. Jeff Miller became the site's official owner-editor-publisher on May 28, 2001 and sincerely acknowledges those who continue to express their support. 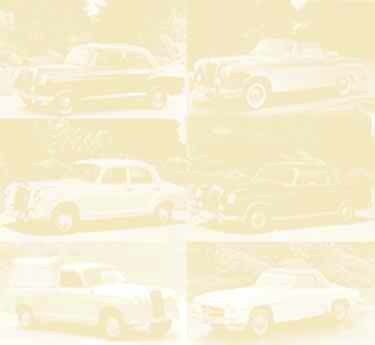 Many thanks go to the devoted members of the International Ponton Owners Group (IPOG) for their numerous contributions.